Infantry is a Thrash/Death metal band from the area of Zaanstad, In the Netherlands. The band was founded in 2006. Infantry is known for their uptempo thrashy songs combined with death slamming riffs. Taking elements from bands like Slayer, Kreator, Decapitated, Strapping young Lad and many more. The lyrical themes vary from world wars, death, destruction and decay, to perverted fantasies. 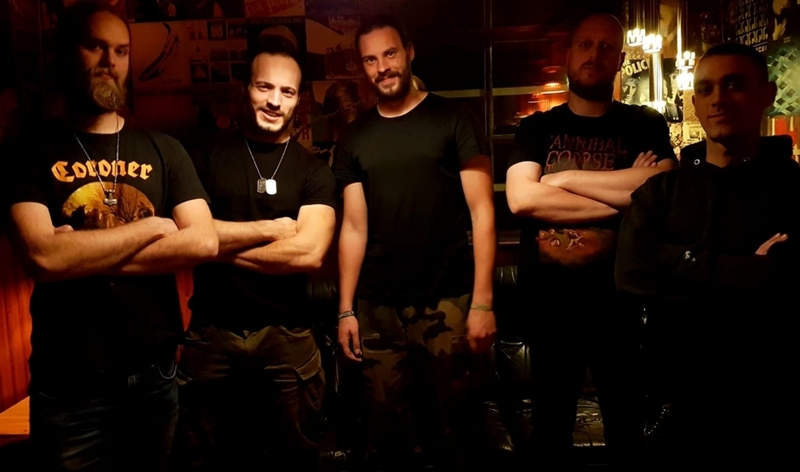 The first line-up was formed by René Kleiss On Drums, Arjen Kleiss and Tom Conijn on the guitars, Luuk Steemers on the bass. Initially, as a group of friends that wanted to play the music they loved to listen to. Bands such as Slayer, Kreator, Legion of the Damned. At this time, still without a vocalist. After playing a while. It was decided that besides playing covers, Infantry should also write own material. And that a vocalist needed to be found to complete the band. This was when Mattis Kaiser joined the effort. And from that point on, the main focus was creating own material. In 2008, having played a decent amount of gigs, the next step would be to record a demo of our first songs. A demo that would come to be known as the Rotting Corpse demo. Two years later, in 2010. Infantry also recorded a full-length CD called ‘’The Stench of Disembowelment’’. Wich was never officially released. After a few years. Infantry faced what a lot of bands will face. Growing apart and busy schedules. This resulted in Tom Conijn leaving the band in 2012. Infantry continued playing and writing material as a 4 man formation. It was clear that Infantry was not reaching full potential, as most of the songs were designed to be played with multiple guitars. After a while, it was decided that it was time to once again complete the line-up. But finding a second guitarist proved to be a more difficult task than imagined. After 2 more years, in 2014, the idea was conceived to look for a bass player instead of a guitarist. Not long after that. Andrea Serra, who had moved from Sardinia to Amsterdam. Heard the call to arms, and enlisted to join he band playing bass. Luuk Steemers took it upon himself to play the role of second guitarist from that point on. Now that the band was back at full strength since a long time, over the course of 2015 Infantry started working on a new project. A project that will become the first officially released full length album of Infantry. And it shall be called: Make War Not Love. Which would be released on April 26th , 2017. In 2016, Infantry participated in the Dutch metal battle. And to our initial surprise, made it through the preliminary round. We then decided to step up our game. Which payed off, as Infantry reached the finals. Although Extremities won the battle, Infantry was voted by the public as the winner of the Public prize! After 10 years of service, Mattis had decided to lay down his arms at the end of 2017. A new vocalist was soon found. And his name is Ronald van Baren. Infantry was once again ready to crush their opponents.